You can buy just the wheel arch as a patch panel. Buy four if you plan to put any size rubber under it as you have to raise the arch and stretch it to fit anything big under a Nova. do you have a link to what your talking about and would mini tubs work instead of changing it? and what do guys use to hid there welding beads never done that before thanks for info!! You will need two for each side patch panels. hear is a rear wheel arch Modified to hold tire bigger than 28 inches tall. Running a wide street tire requires surgery to the "frame", moving or eliminating leaf springs and relocating the shocks to inside the "frame". Same as an earlier Chevy II four patch panels cut and welded to improve tire clerance. Even a Funny Car tire (36-14.5x15) will fit if you modify the body. 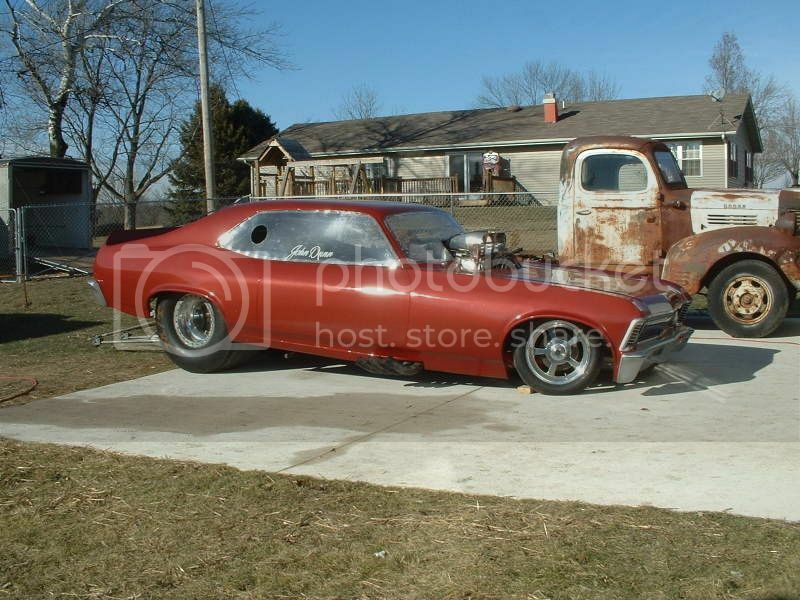 Do you know of any supplier that sells the "full" quarter panels for 73-74 Nova's? I have only been able to find full quarters for years prior to 73, but for the 73-74 the replacement quarters are 'notched' below the back window. I have a bad dent into the body lines right below the back window and really don't want to have to try and beat the metal out and use a ton of filler, ya know. I've attached some pictures to show what I mean. Thanks! Welcome to Team Nova Justin! From what I'm reading they're not being produced yet??? could be wrong though.. I don't understand the restrictions keeping the manufacturers from making the full quarter? The random 'cut-off' line on the quarters they supply must be an absolute chore to try and cut out of the car and then match up! It goes at a diagonal across the body lines and all! Who thought up that? haha? That "dent" is a pressure crease caused by some one hitting your car in the rear end in the past and not repairing the damage. You probably have a lot of hidden damage under the car as well.